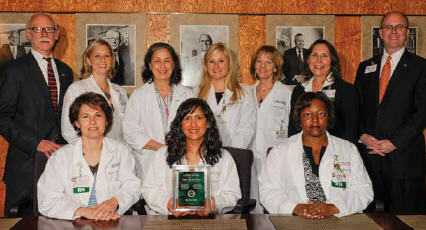 Seated (from left): Theresa Partida-Aguirre, RN, Husai Kelliher, RN, and Damaris Echevarria, RN. Standing: Brad Hinrichs, MBA, Elizabeth Myers, RN, Linda Murphy, Sarah Papadopoulos, RN, BSN, Maria Sieczka, RN, Mary Hellmich, BSN, RN, and J. Robert Clapp, Jr., FACHE. When several nurse coordinators left the kidney transplant program late last year, the other nurse coordinators in the program either took on new duties, worked extra days, assumed an increased patient load or otherwise restructured their work to ensure that the many patients seeking kidney transplants at Rush continued to receive high-quality care. In recognition of their dedication and hard work, the Rush kidney transplant nurse coordinators team received the Team of the Year Award. Pretransplant nurse coordinators play an integral role in the transplant process, serving as the initial contact between the patient and the transplant program. These coordinators screen patients with end-stage kidney disease to identify viable candidates for kidney transplantation. They also work closely with transplant surgeons and nephrologists to provide consistent quality care as patients progress through the referral, evaluation and pretransplant management and listing processes. The pretransplant nurse coordinators currently are responsible for 454 patients who are awaiting a kidney transplant at Rush and another 400 other patients who are undergoing medical evaluations in order to be put on the waiting list for transplant. Posttransplant nurse coordinators are equally important, managing and coordinating the care of more than 300 posttransplant patients each month. Their relationship with the patient begins immediately following transplantation — they are part of the multidisciplinary clinical team that makes rounds to see the transplant patients in the hospital, and they provide transplant education before patients are discharged. When their colleagues left the program, two posttransplant nurses quickly adapted their schedules to accommodate the demands of the prekidney transplant clinic. Elizabeth Myers, RN, and Heather Clark, RN, jumped into their new roles, observing the departing nurses before they left Rush and asking them a lot of questions. Myers and Clark worked closely with Maria Sieczka, RN, the remaining prekidney transplant coordinator, who was instrumental in their training. During the transition, Sieczka increased her patient load and on-call responsibilities to ensure the success of transplanting appropriate candidates. The nurses brainstormed with management about ways to use internal resources to fulfill prekidney transplant nursing roles. As Myers and Clark transitioned to their new positions, Linda Murphy, RN, a prekidney transplant nurse coordinator, volunteered to add two more days to her schedule to help see initial patients seeking transplant. Prekidney transplant nurse coordinators Theresa Partida-Aguirre, RN, Husai Kelliher, RN, Sarah Muench, RN, Pamela Rohde, RN, Lena Christudhas, RN, Jennifer Gilsdorf, RN, and Damaris Echevarria, RN, began restructuring to maintain quality of care to the posttransplant patients. In addition, Richard Reyes, living donor coordinator, collaborated with the nurse coordinators during clinics to expedite the patient flow. In addition, the four other nurses in the University Transplant Program were instrumental in helping the kidney transplant program maintain its commitment to patient care. They include Linda Luevano, RN, vascular access nurse coordinator and liver transplant coordinators Walter Johnson, RN, Krystyna Ciezczak, RN, and Linette Edmond, RN. This entry was posted in Nursing, Transplant and tagged kidney failure, kidney transplant. Bookmark the permalink. Pingback: Kudos and Congratulations « Donate Life Illinois – Organ Donation News – I am. Are you?